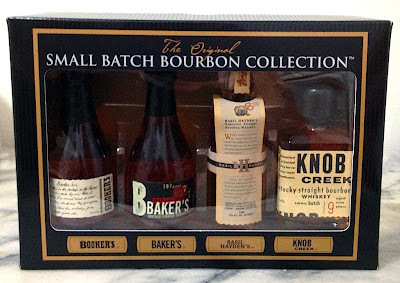 Small batch bourbons occupy a slightly peculiar place in the whiskey world. They don't have the same uniqueness and variation as single barrel expressions. At the same time, they are generally presented as superior to the more pedestrian bourbons that are produced from blending a large number of barrels together to generate extremely consistent products. Small batch falls somewhere in between, where a small number of superior barrels (one to two dozen barrels seems to be a fairly standard range) are blended together to produce a higher quality yet reasonably consistent product. 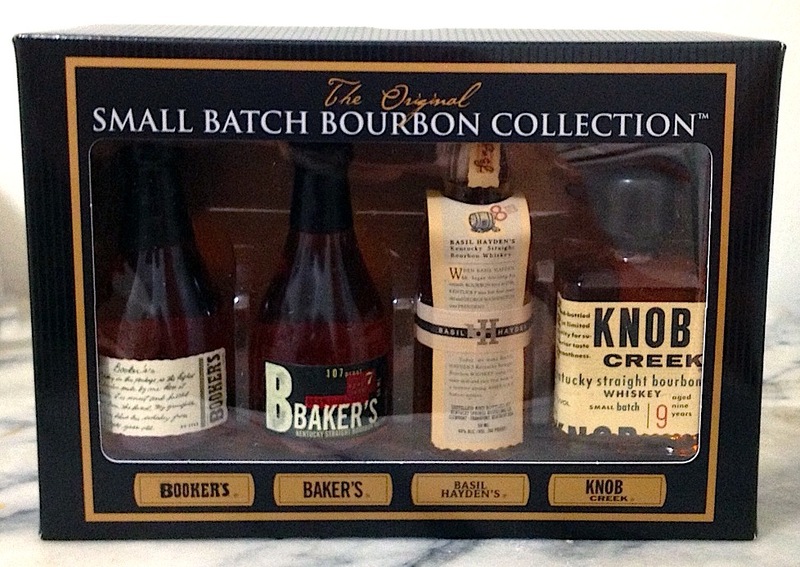 Here are three of the more reasonably priced small batch bourbons, in order of age. This is Jim Beam's starter small batch bourbon (reviews of the other three coming in the future). Clocking in at a solid 50% alcohol, this can be just a little overpowering at first, but becomes extremely approachable with only a little water. It took me a little while to warm up to this bourbon because the first few times I tasted it were with a less-than-clear palate, at which point it tasted primarily like corn, without much complexity or depth. It's surprisingly spicy for only being 15% rye, but they put their basic mash bill (it's the same as the basic white and black label Jim Beam bourbons) to good use. Admittedly, the 9 years that the juice spent in barrels before being bottled accounts for much of the difference, as well as the higher proof. 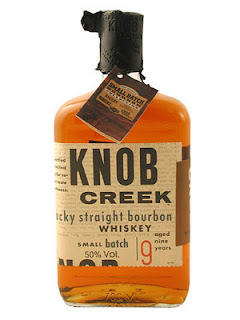 Right now Knob Creek is only $34 in Oregon, which is a price I would consider to be quite reasonable. Normally it's close to or above $40, at which point it becomes a slightly harder sell. 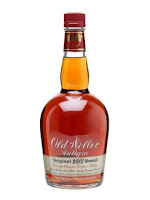 So if you can find this bourbon closer to $30 than $40, I'd say go for it. If not, just wait because it seems to go on sale with some regularity, especially around this time of year when a bottle makes a good Christmas present. Nose: Yeasty, with subtle grains and berries, rising bread dough and an undercurrent of corn sweetness, vanilla icing and brown sugar if you dig for it. With water, I get a very nice note of chocolate-covered caramels. Produced by Wild Turkey, Russell's Reserve bourbon is meant to be a step up from their basic bourbon, much like their Russell's Reserve rye is meant to be a step up from their basic rye. As I mentioned a few months back, I wasn't terribly impressed by the RR rye. Thankfully the bourbon is significantly better. A minimum of 10 years in oak versus the rye's 6 years makes a big difference, adding layers of complexity to produce a quite enjoyable sipper. 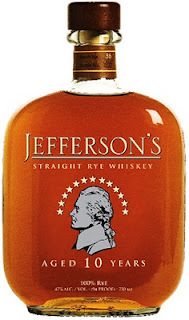 Much like the Knob Creek, this is not a particularly high rye bourbon, with only 13% rye in the mash bill, but manages to bring forward many of the enjoyable characteristics of rye whiskey while supplementing them with a solid base of sweet bourbon flavor. While it might be a little off-putting to some people, I also really enjoy the fresh, yeasty flavors of this bourbon. It seems like this bourbon can be found for $30 or less, which is a quite reasonable price point considering the quality you're getting here. A solid recommendation from me on this one. A small batch bourbon produced by Heaven Hill distillery, this is one of the first bourbons I ever bought. It's significantly older than the either of the other bourbons I've reviewed today and it shows in the more prominent oak flavors throughout the whiskey. 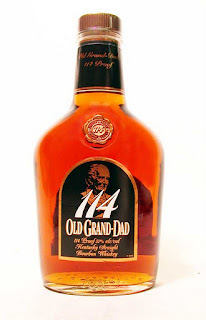 Interestingly, despite the losses associated with the angel's share during aging, this is also the cheapest bourbon in the group, regularly on shelves for less than $25. That alone provides a fairly strong incentive to give it a try. 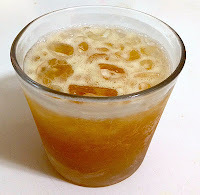 Additionally, I find that it's a good choice in whiskey cocktails as its burlier barrel flavors can punch through the other components of a drink. It was the main component of my Highland Breezes tiki drink and also works well in a Bourbon Special. So while I'd pick the Russell's Reserve and Knob Creek over the EC12 as sippers, there's definitely a place for this bourbon on your shelf. The Highland Park distillery is currently the most northernly scotch whisky distillery, located on the Island of Orkney. Despite the name, this distillery is technically not part of the Highland scotch whisky region, instead being included in the loosely defined 'Islands' region off the Highland coast. The distillery also has the distinction of being one of the few distilleries to malt and dry its own barley, with an extra twist coming from the addition of heather to the locally cut peat that is used to fire the drying kilns. Last, but not least, their whisky is aged exclusively in used sherry barrels, which are either American or European oak and either first-fill or refill casks. This fact is highly touted in their product information, going so far as to claim that sherry casks are inherently superior to ex-bourbon casks. While I can agree that there are virtues to using ex-sherry barrels for aging, there are plenty of excellent whiskies out there that have never touched anything but used bourbon barrels. The Glenmorangie Original expression is an excellent example of what bourbon barrel aging can do for single malts. But really, that's my only complaint about Highland Park and could be easily remedied by reigning in the marketing department a bit. One last interesting note is that the American bottlings of Highland Park's 12- and 15-Year expressions are at 43% alcohol whereas the European bottlings are at only 40%, which probably helps to dial up the flavors of the American versions just a hair. Nose: Sweet sherry, smoky peat, a touch of vanilla, cacao and nuts. With a bit of water the sherry moves forward and transforms into more of a dry Oloroso style while the peat becomes more vegetal. Taste: Big honey and juicy raisins up front, shifting through creamy pepper and chili mid-palate. With water, the upfront sweetness is slightly toned down, followed with orgeat, spice and some dry bourbon notes. 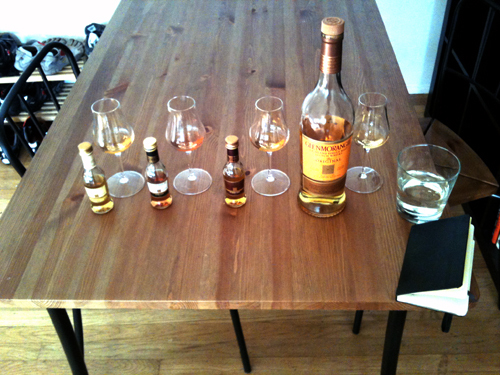 Finish: Drying, with dueling sherry and barbecued peat initially, with a touch of seawater at the very end. This is transformed into creamy unsweetened chocolate, coffee and gentle peat after the addition of a bit of water. This is in my opinion a 'must-have' single malt. It's regularly in the low-$40 range and is only $36 in Oregon until the end of January. For being on the younger side, this whisky brings an incredible range of flavors that shift dramatically from the nose to the palate through the finish. The stark contrast between the explosive honey sweetness at the beginning of the sip and the intensely drying finish is delightfully shocking. Before drinking this scotch, I was generally under the impression that I didn't like peated whisky. This is one of the more lightly peated single malts out there and is thus a great way to ease into that aspect of scotch whisky. The smoke compliments the other flavors extremely well and doesn't dominate any part of the experience, especially after adding a few drops of water. 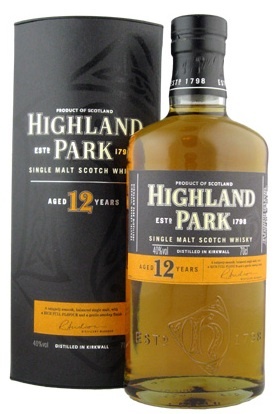 Highland Park has been described as bringing in a little bit of flavor from each of the other scotch whisky regions and I would say that's a fair encapsulation. 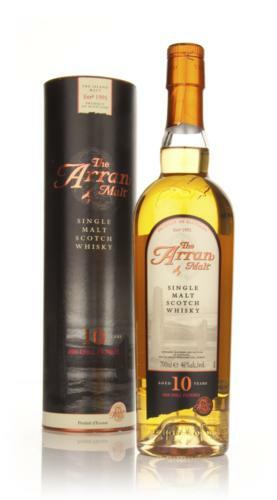 It's a multipurpose dram, being enjoyable whether you just want something to sip with company or if you want to sit and spend time thinking about all of the different flavors drifting across your palate. I'm really looking forward to trying the older Highland Park expressions as their youngest offering speaks extremely well of their skill in all aspects of whisky production. I trekked up to Seattle to visit my parents for Thanksgiving this year. Instead of having the feast at home, we were all invited over to eat with friends of the family. As part of that, I was asked to make drinks for everyone. Obviously something harvest-themed seemed appropriate and apples are a major Northwest crop. So an easy pick was Clear Creek Distillery's first-rate apple brandy. It's absolutely bursting with apple flavor and provides and excellent base for a cocktail. 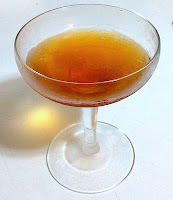 While I wanted to go with something akin to a Sidecar, St. Elizabeth Allspice Dram from Haus Alpenz seemed like a slightly better accompaniment since it has so much spice flavor that is associated with pumpkin pie and the like. To cut down on prep time, I made it punch style, adding water up front to give the proper dilution and then chilling in the fridge beforehand. Combine all ingredients and chill for at least an hour before serving. I was pretty pleased with how this one turned out. The apple flavors are primarily a base for the other elements. The lemon juice and allspice dram are more assertive and the balance is towards tartness rather than sweetness. Overall, quite delightful. Here's hoping that everyone had a good day, both those of you in the U.S. celebrating the holiday and any readers from further abroad. It's been far too long since I got in on a Mixology Monday event. This week's theme, hosted by Jacob Grier at the Liquidity Preference, is Retro Redemption. Roughly from the 60s through the 90s were a dark time for cocktails. 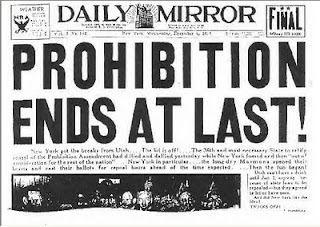 The pre-Prohibition Golden Age was long gone and the tiki era had faded. Preferences were shifting towards wine and beer, with vodka being the one spirit that retained much sway. The cocktails that did emerge during the late 20th century tended to be dilute and fruity, hiding rather than showcasing their alcohol. As we emerge back into the light of fine drinks, many want to shun that era and consign all of its creations to the dustbin of history. But this week we are attempting to resurrect these Frankenstein creations, either showing that they have value in their natural state of tweaking them into more pleasant concoctions. Having been born only near the end of that time period and only begun my journey down the path of true mixology after the turn of the millennium, I can't lay claim to having experienced any of these creations in their natural state. Sure, I've had a Lemon Drop or two before, but these days I mostly drink at places where I can expect a well made cocktail or at least a healthy pour of whisk(e)y. So stepping off into the unknown, I paged through my copy of the Joy of Mixology, looking to see what might have managed to slip into its hallowed pages. As it is primarily aimed at current or perspective bartenders, there are some slightly dubious creations that might be called for by less discriminating customers. Such as the Long Island Iced Tea. Rightly infamous, the original recipe calls for a brain-busting 4 ounces of hard spirits as well as another ounce of liqueur. 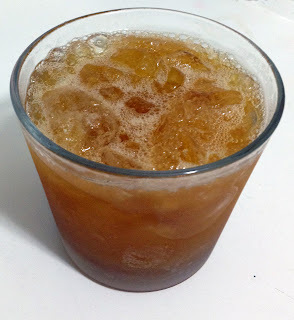 But this potent punch is well hidden among the strong flavors of lemon juice, simple syrup and cola. While not known for being the most refined drink, it is certainly a more pleasant way to get smashed than, say, drinking straight grain alcohol. But I wondered if this excuse to turn bottom-shelf liquor into money and dubious decisions could be reworked into something a bit more mixologically sound. Combine all ingredients, shake with ice strain into a glass filled with ice and top with cola. From this starting point, I wanted to make a drink that would put the spirits a little more front and center while retaining a similar flavor profile and hue. And, you know, not quite so large. Some days it's nice to not knock yourself over. Build over ice in a chilled glass and briefly stir to combine all ingredients. For some reason, this made me think of Antillia, the Island of Seven Cities that explores combed the Atlantic ocean for during the Age of Discovery. Some of it is the diverse ingredients, coming from just about every continent on earth. I had to make due with what was already in my liquor cabinet, which is, admittedly, a fair bit. I drew some inspiration for this variation from a couple of tiki drinks, namely the Fog Cutter and the Scorpion. Both of these drinks incorporate rum and gin, which are not an obvious combination. However, when made well they are both absolutely brilliant. For the vodka, I only had one choice: Medoyeff. While it's admittedly playing a supporting role in this case, I will say good things about it. My bottle comes from when it was still made by House Spirits, but the label has since migrated with the eponymous Lee Medoff to the Bull Run Distillery. While it's made to be drunk straight in the Eastern European fashion, it was on hand and fulfilled its duty to buck up the alcoholic content of this drink without crowding out the other flavors. The aged light rum was Banks 5 Island (part of the spark for the name of this drink), a particularly robust and flavorful light rum. I decided to go with reposado instead of blanco tequila to mellow that aspect of the drink just a bit and keep it from overwhelming the other flavors. I'm quite partial to Corralejo reposado and it is very close to a blanco in appearance, having only a very light straw color. The gin was Hendrick's, which is a very gentle gin that plays well with others and provides a number of very nice floral notes to the drink. 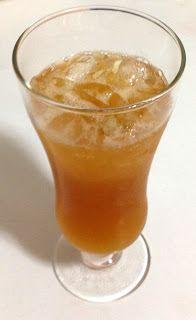 The orgeat was also inspired by the Fog Cutter and Scorpion, where it helps to tame the strong flavors of those drinks. The sip leads you through the various layers of flavor rather than dissolving into an ill-defined gimmish. The gin and rum lead the charge, the juniper snap of the gin and the hogo of the rum joining forces. This is followed by the agave notes of the tequila that segue back into the more floral notes of the gin. The spices from the Angostura bitters fill the role that the cola would otherwise play and the fruitiness of the orange-kumquat liqueur and the subtle nuttiness of the orgeat round out the experience. Behind all of this, the lemon juice helps to give the drink some backbone and the soda water leavens the experience. While probably diverging from the drink's roots, you could still squint in its general direction and imagine that there's some tea in there, so I feel like I haven't strayed too far. This is a drink that I would happily sip year-round. After nearly disappearing from the market, rye whiskey has been clawing its way back into respectability (and occasionally great acclaim) over the last decade. While most of this whiskey is made in the United States, rye is also made in Canada. 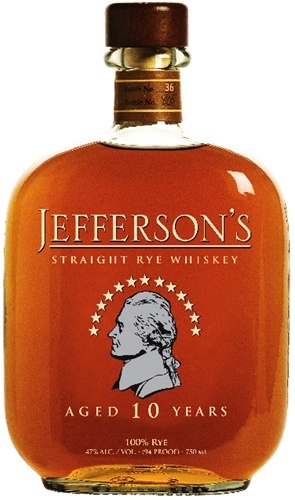 However, this whiskey is rarely bottled as straight rye, instead being blended into Canadian whisky to add flavor. As an additional quirk, this flavoring whisky is 100% rye, without any corn or barley. A few companies have approached the distillers of this whisky and purchased barrels to bottle as straight rye whiskey. Whistle Pig took this approach and has garnered all sorts of accolades in the process. However, it also costs a pretty penny. Now McLain & Kyne, previously known for "very small batch" bottlings of Kentucky bourbon, have tossed their hats into the ring and have also bottled some 10-year old 100% rye whiskey. Even better, it retails for about half the price of Whistle Pig. This is a great whiskey. M&K have selected a really solid rye and put it out at an incredibly affordable price point. In Oregon right now it's only $34, which is a very small bump up from the baby Sazerac, Russell's Reserve, and Bulleit 95 for a significant increase in age and quality. There's a little more competition once it gets up around $40, but I'd still call it a good buy then. There's enough going on that you can spend a decent amount of time dissecting the various flavors, but it's also pleasant enough to be a relaxing drink at the end of the day. My only complaint, which syncs up with other opinions, is that it could use a slight boost in proof. Somewhere between 100-110 would hopefully ratchet up all the flavors without cutting into profit margins too much. So all said and done, if you like rye, or even whiskey in general, you owe it to yourself to give this one a try. While I've mentioned Lustau sherry once before, I didn't get to talk much about this particular class of fortified wines. Much maligned due to a lack of understanding of how best to store, serve and drink it, sherry is slowly regaining the profile that it deserves. The English word sherry is a corruption of the Spanish region of Jerez, where all sherry is produced. It shares similarities with port, in that both are fortified with neutral grape spirits during the aging process. There are a number of different styles of sherry that vary both in terms sweetness, ranging from bone dry to sticky sweet, and oxidation, from fresher finos to old olorosos. While sherries are naturally dry due to complete consumption of the natural sugars, some will be mixed with sweeter wine varieties such as Pedro Ximénez or Moscatel to produce sweet sherries. All sherries are aged in barrels under a natural layer of yeast that prevents oxygen from contacting the aging sherry. For the flor to survive, the sherry must be between 14.5% and 16% alcohol. Below that percentage, the flor will not properly form. Above, the yeast die and the sherry will start to oxidize. Some sherries, such as finos and manzanillas, are aged entirely under the flor. Others such as amontillados and olorosos will be fortified above 16% alcohol to kill the flor and allow oxidation. Sherry it traditionally aged in the solera system. A set of barrels is established and transitions occur at regular intervals. Finished product is withdrawn from the oldest barrels and refills from the next oldest. This proceeds up to the newest barrels, which are filled with new product. This means that there is always some of the old sherry left in the barrel, which continues to be aged and mixed. Lustau East India Solera sherry is designed to replicate an accidental product. Sherries were shipped around Africa to India where the barrels experienced a wide range of temperatures in a humid environment. It was found that this developed an extraordinary smoothness and complexity. Lustau replicates these conditions by aging the sherry in warehouses which are kept very humid and where the temperatures are allowed to vary widely. This sherry is a blend of oloroso (85%) and PX (15%) wines aged betwen 15 and 50 years. On the nose, this sherry is full of raisins tinged with walnuts and almonds. The taste, while distinctly sweet, is not cloying and finishes with more raisins, nuts and a touch of chocolate. This is a fantastic dessert wine that would work well in a lot of the same places as a tawny port. Additionally, as it has already been aged for decades and has a relatively high (20%) alcohol and sugar content for a sherry, it should last a while in the fridge. While perfectly good by itself, I wanted to play around a bit and see what I could do with it in a cocktail. Combine all ingredients, shake with ice and strain into a chilled cocktail glass. Squeeze a twist of lemon of the top and drop into the drink. 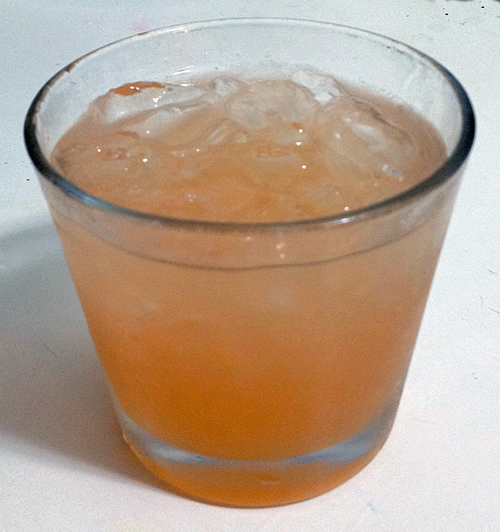 While basically a twist on a whiskey sour, I was pretty pleased with how this drink turned out. While the sherry plays a supporting rather than leading role in this drink, it is an essential component. As I noted above, this sherry has Pedro Ximénez grapes in its mix, which give it quite a bit of sweetness. The nose is full of lemon oil, grain from the whiskey, spices from the syrup and bitters, with just a hit of raisin from the sherry. 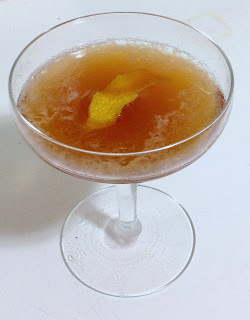 The taste is wonderfully layered, with the whiskey and sherry dancing around each other, bolstered by the sourness of the lemon juice and snappiness of the bitters. The bitters also help to bring out a bit of the nuttiness in the whiskey and sherry. You're going to want a rather stiff whiskey here. I've tried a few different types including Russell's Reserve Rye and Old Grand-Dad 114. I like it a bit better with rye whiskey as the bold, spicy flavors of rye stand out more than bourbon does. Rittenhouse Rye would be an obvious choice, but something like the 110-proof Willett 4-Year Rye would probably be absolutely perfect. Much like Barbados rums, Guyanese rums are another one of the quintessential varieties of rum. Also known as Demerara rum after one of the country's main rivers, all of this delightful nectar is produced by one company, Demerara Distillers Limited (DDL). Though there were previously hundreds of different distillers connected with the various sugar plantations, they have consolidated over the years. Guyanese rum gained early fame as it was one of the primary varieties that were sourced to make the British Navy's rum blend. One of the features that makes Demerara rums unique is the variety of stills that are used in their production. Each still has its own code, which is usually the name of the sugar estate that the still originally came from. The wooden stills are the most famous as they are the last of their kind on earth. The two links above can give more detail than I could ever hope to get out here and are an absolute treasure trove for anyone who wants to know more about the fascinating capabilities available to DDL. Demerara rums are known for having particularly heavy, molasses-driven flavors. Two prime examples of this are the flagship offerings from DDL, the El Dorado 12-Year and 15-Year rum. Working off of Sascha's eminently helpful diagram, ED12 is made up primarily of rum from Diamond (SVW), one of the two-column metal Coffey stills as well as the Enmore (EHP) wooden Coffey still. 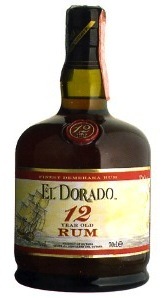 As with all of El Dorado's offerings, the 12-Year indicates the age of the youngest rum in the blend. This rum is one of the best values out there. Incredibly rich for its age, this rum can be found for as little as $25 (take that, single malt scotch!). There's probably a lot more to find in this rum, but as the weather changes as my nose gets a bit stuffy, the main notes are most of what I can find right now. But even if that's all you get out of it, this is still a fantastic, delicious dram. ED12 also works really well in a cocktail. However, it has to be used careful because its flavors can easily dominate the drink. Balance is important, especially in tiki drinks with over half a dozen different ingredients. Combine all ingredients, add a small handful of cracked ice and blend for five second. Pour into a chilled glass with more cracked ice. This is a very rum-centric drink. The syrups add complexity and flavor, but mostly peek around the edges rather than being front and center. I like to make this one with a 2:1 split of ED12 to ED5, just to lighten the drink a bit. For the aged Jamaican, the Bum recommends Appleton 12 year and I heartily concur. It adds just the right amount of funk to the drink. The ED12 forms the backbone of the drink and all of the other flavors orbit around it. The fruitiness adds a good amount of zip to the drink and the lime's sourness is perfectly balanced by the honey's sweetness. A cursory web search suggests that this isn't one of the more popular drinks from Sippin' Safari, but I feel like it deserves a bit more recognition. This is an eminently sippable drink, but it does require top-notch ingredients. Again going back to Sascha's work, this rum is composed of spirits from the Port Mourant (PM) wooden double pot still and SVW as well as EHP and Versailles (VSG), the single wooden pot still. These rums are then aged for at least 15 years and blended together. Personally, I have to agree with Capn Jimbo that this rum is just about overdone. For me it has spent just a little bit too much time in the barrels. The oak flavor is a little too assertive for my taste and I think this would be a better rum if that influence waned. 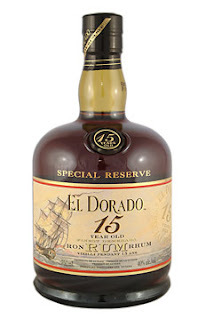 If you happen to like oak, you'll probably enjoy this rum a bit more than the 12 Year, but for me it's hard to justify the extra $10 on the price tag. It's an interesting experience, but at the end of the day I'd rather be drinking the 12-Year.